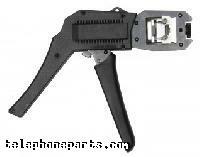 The EZ-RJ45 crimp tool features a built-in cutter and stripper that crimps and cuts wires in one operation. It accommodates EZ-RJ45 Connectors, and most standard RJ-45 and RJ-11 connectors. This craft-friendly tool features precision ground crimp dies, and a full cycle ratcheting mechanism. 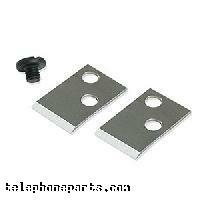 The EZ-RJ45 Crimp Tool is constructed with a steel frame for strength, and durability. Crimps and trims wire, and EZ-RJ12/11 connectors in a single cycle. Terminates both solid and stranded cable. 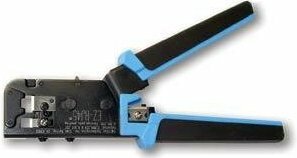 EZ-RJ45 Crimp Tool, high quality crimp tool designed to quickly crimp and cut the wire of the EZ-RJ45 connector, Crimps and trims the EZRJ45 in one cycle. This crimper crimps the EZ-RJ11 connector, but you must trim the wires with regular sidecutters. Works with most other RJ11/RJ45 connectors also. The 1000544 was developed to meet the needs of the most quality sensitive installation professionals, and to surpass the most demanding network performance standards. Precision manufactured to the highest international standards the EZ-VIKING™ delivers the highest quality and consistent modular plug terminations available. Optimizes termination of EZ-RJ45® Cat 5e/6 regular/shielded & external/internal ground connectors.